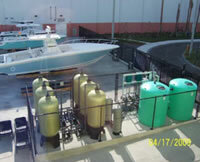 Water Recycling Units for new Florida Marina. PROBLEM: A large new Florida marina needed to provide clean recycled water to 18 boat wash hose locations for hull cleaning. Since no city sewer was available, all water had to be captured and recycled. The marina wanted the system to operate 24/7 with minimal maintenance and constant exposure to the heat, sun, humidity, and salt air. 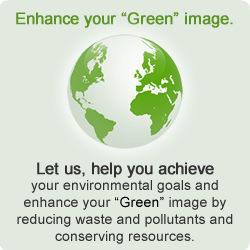 SOLUTION: Washbaysolutions designed a 200-GPM closed-loop reclaim system to capture, treat, store, and deliver clean recycled water to the hose bibs. The system incorporated a large ozone disinfection system, fully automated filter valves for filter backwashing, PLC control of all filter functions, and all non-ferrous components and hardware. The system also incorporated a rain detection system to manage excess rainwater in the collection system, and a fresh water makeup system to compensate for evaporation losses. RESULTS:The customer is very happy since the system has operated continuously since start-up with no downtime. It continues to deliver extremely clean recycled water. Average maintenance time is minimal.